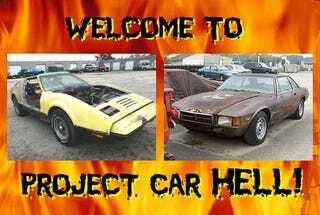 Project Car Hell, Best Of 1974 Edition: De Tomaso Longchamp or Bricklin SV-1? Welcome to Project Car Hell, where you choose your eternity by selecting the project that's the coolest... and the most hellish! Last time, we watched in disbelief as the insanely complicated agglomeration of iron oxide shaped vaguely like a Jensen FF got shellacked in the Choose Your Eternity poll by the much simpler- yet more glamorous- Aston Martin DB5. Today we're going to take a trip back to the era of Synanon and presidential resignations, with a couple of innovative Detroit V8-powered machines you rarely hear about these days. Project Car Hell, Anglomasochism Edition: Aston Martin DB5 or Jensen FF? You hear a lot about the De Tomaso Pantera- especially after Vince Neil couldn't even drive one to the liquor store without incident- but the little Italian car company with a love for Ford Cleveland power built other fine automobiles as well. For example, the De Tomaso Longchamp, a mean-looking coupe with 351 snarling Dearborn horses under its hood. Only 409 were ever made, so you're probably breathing a sigh of relief despondent that you can't get one for your personal Hell Project. Not so fast, sport! Jalopnik is on the case, and we've unearthed- yes, that's the word- this 1974 De Tomaso Longchamp with a starting bid of just one dollar... and that's with no reserve, we might add. Some of you who harbor dreams of getting a last-second acceptance into the 24 Hours of LeMons New England race might be taking note of the New Hampshire location of this car, but how could you let a jewel like this get all beat up on a race track? Why, that rust might not be as bad as it looks! And rest assured that this is a numbers-matching car, so you can bank on making a huge profit at Barrett-Jackson after you restore it. What's your favorite Canadian car company? For us, it's got to be Bricklin. Yes, the man responsible for bringing Subarus and Yugos to our continent also built his own sports car, the Bricklin SV-1. Back in the 70s, the man at the wheel of an SV-1 didn't have to worry about where his next STD would be coming from, because all the ladies were eager to dish up the spirochetes to a Bricklin-equipped gent. While we could have gone with a 351 Cleveland-powered SV-1, this AMC 360-powered '74 model has nine more cubic inches and a big helping of Kenosha Kool. And look- a 4-speed! Jack up the Malaise power output to, say, 500 horsepower and you'd have the best of Early Malaise style coupled with modern-day acceleration. The seller's description would work a lot better without the photographs, we think; words like "excellent" and "beautiful" don't seem to fit the utter basket case challenging project pictured. It appears that the fiberglass has rusted somehow. But hey, the engine runs and the car drives- how hard could it be?